I recommend to download this simple spreadsheet (.xlsx) with ECB gold data since December 1999 in order to better comprehend my reasoning. 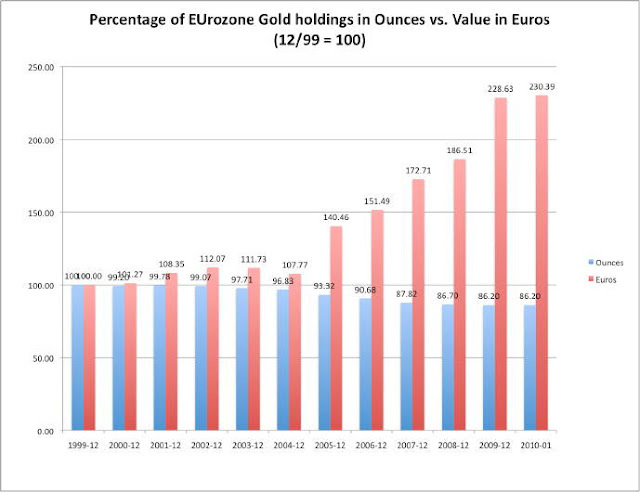 These figures by country show that Eurozone central banks stopped selling gold in 2007 and make one wonder where the 2,000 tons gobbled up by Indian investors since then came from. Indians are the single biggest group of bullion buyers and has seen annual demand rise from 200 tons to 500 tons in the last decade. In 2008 world gold production was down 13% to 2,260 tons from its 2001 peak of 2,600 tons, date from the US Geological Survey show. Chinese gold production rose by 11.34% in 2009, to 313.98 tonnes, according to statistics released by the China Gold Association. The largest gold producer in the world hoards most of its domestically mined gold. Putting this data in context with markedly higher gold price volatility since 2007 raises the question whether central bank gold sales result in anything other than short term price changes. In stark contrast to normal market behaviour, where the seller wants to get the highest price possible, central banks certainly left a lot of money on the table by pre-announcing their sales, re-announcing them while at it and telling it the public a third time after the fact. One is also left in the dark about gold leasing or swaps. 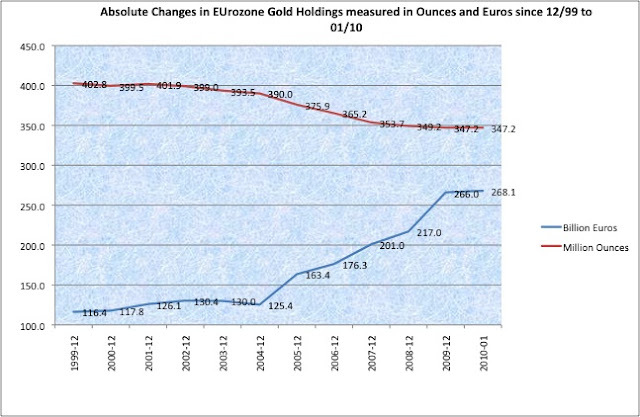 Both the ECB and its members only publish raw data, omitting any information that could shine a light on continuing allegations that central banks sit on far less bullion than the official figure of some 30,000 tons (pdf). Following the recent discussions around GATA's appearance at a CFTC hearing and the revelations of former gold trader Andrew Maguire (+ more links), whose precise forecasts about a takedown of the price of gold after NFP figures in February were ignored by the CFTC I am led to believe that a massive squaring of paper gold positions and the resulting short squeeze will lead to a melt-up in the yellow metal at a not too distant point in the future. As after every bubble based on fiat money and exploding debts gold will be en vogue again. It was never different in the last 6,000 years. Euro, dollar and Sterling are all doomed to go the same ways as all fiat currencies in the last 300 years. There is no such thing as floating currencies. They are only sinking at different speeds vs. gold. Congratulations with your new look web site: fresh, clean, linked to the top: great!